What started as a long weekend out with my mates, ended up with me doing a solo backpacking route. We had decided on the western Lake District, a new area for some of us, as well as having the next Wainwright fells in my top down list. Not wanting to waste a good forecast for Saturday, so off I went on my tod. Great Gable from the track out of Wasdale Head. 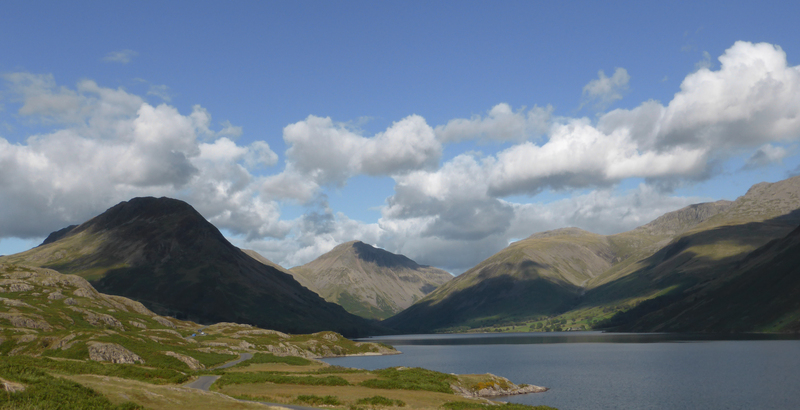 It is a long drive around to Wasdale, even taking the beautiful shortcut over Ulpha Fell. So it was around 11:00 before I set off, with a plan to walk the full skyline around Mosedale, including Great Gable and Kirkfell camping somewhere around Wind Gap. There were very few walkers around on the path up to Styhead and it wasn’t until the top of Great Gable that I met more than a couple. Cloud had fallen to cover the summits by now, which was a shame, I had looked forward to the views from Westmorland Cairn. Had a panic when I found that the FRCC War Memorial had gone, until I discovered a note left on the summit to explain it had been taken away for refurbishment, phew. Mist meant that a bearing had to be taken from the top to pick up the correct line of cairns taking me down to Kirkfell Tarn. Then up again to Kirkfell. This is quite a drop and pull up to the top again, my legs were beginning to grumble at the extra weight on my back. More cloud and only a single couple of walkers around, it was strangely quiet down to Black Sail pass. This is the usual start of the high level route around Mosedale, but as the afternoon was wearing on, there was nobody around, even here. To add a bit of variety up to the top off Pillar I looked for the High Level route to Pillar Rock. The start is deceptive and the path is narrow and unmarked in places. In general, all the paths around this part of the Lakes were considerably less worn than those closer to the M6. Paths around Pillar were generally as they were back in the days when Wainwright wrote his guide (1966) and when I used to be up here a lot (1970’s). This path was fun to follow, lots and ups and downs, crags to skirt and boulder fields to cross. Cloud still covered views as I rested at Robinson’s Cairn and Pisgah. Recreating previous climbing routes to the top of Pillar Rock was definitely out today. By the time I struggled to the summit, I was exhausted and it was getting dark. I spotted what must be the best wild camping spot in the country, just 10m from the trig point, a rock free, tent sized level bit of ground, mainly surrounded by a low wall windshield. 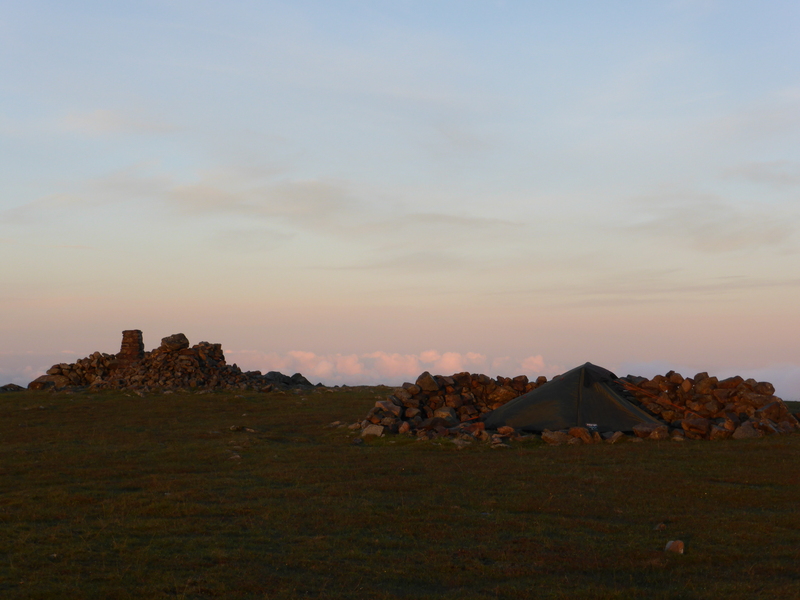 That was it, tent up, dinner made and enjoying a slight pink glow of the sunset through a break in the cloud. 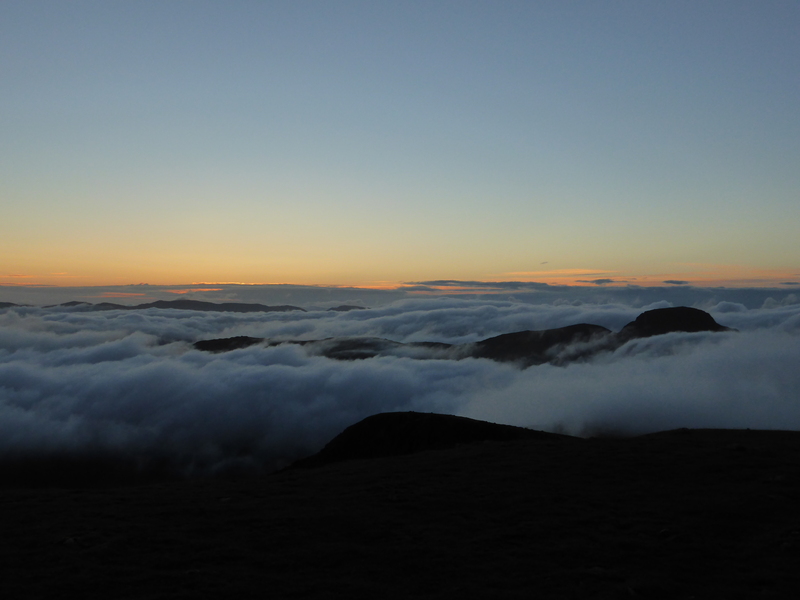 During the night the wind shifted around, the cloud lifted, so as light started to break, I peaked out of the tent to a fantastic cloud inversion, flecks of mist whipping up the valleys. I sat and snapped the views and watched the sun rise over the Pennines, bursting through with spectacular effect. What a great 30 minutes of natural splendor. Sun’s Up time to move on. Streaming up the valleys, the cloud came back to fill the sky, so after breakfast and packing, I was back in a thin mist. After five minutes walking I spotted something odd out of the corner of my eye. 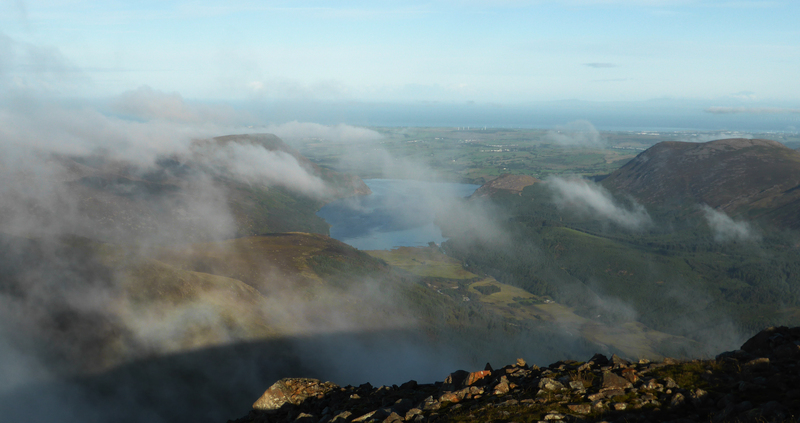 Mist was lifting slightly and sunlight broke through projecting my shadow onto the cloud. 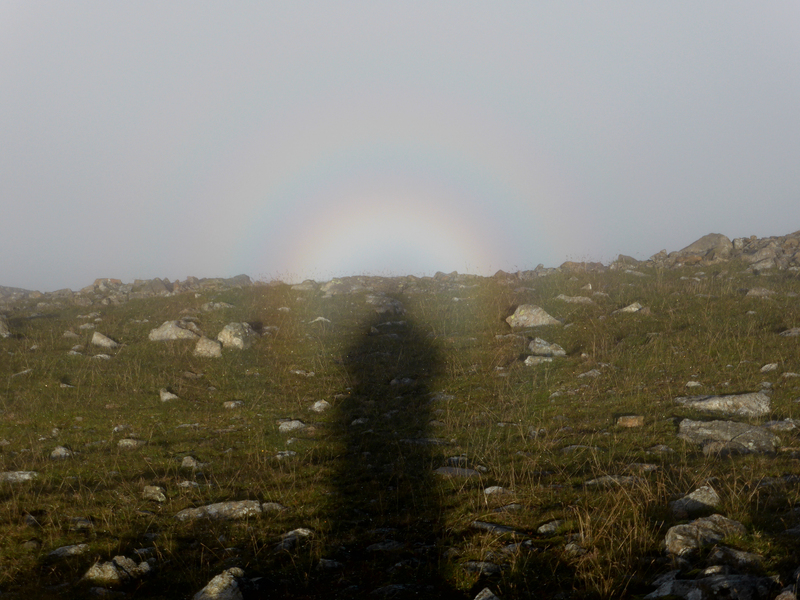 Wow – a Brocken Spectre ( aka a Glory). I had a real halo around my head. I had become Saint Anthony! The Glory moved around to the edge of the ridge, and hung there too faint to be photographed. That was stunning. Now down to Wind Gap and up to Black Crag and Scoat Fell and its side peak, Steeple. As an aside, I have been scanning in my old photos of the Lakes from 30 years ago. I recall a superb picture of Steeple on a glorious day. I will look that up when the weather closes in and I am not out on the hills. Now I had to find some water, a spring just below the summit provided fresh sweat tasting supply, nicely bubbling over a rock before cascading down to Scoat Tarn. Time now to grab a couple more Wainwright fells, so I broke away from the head of Mosedale to pick up Haycock and Caw Fell, the latter, more of a gentle grassy ridge down, than a fell in its own right. Still, its there in the book, so needed to be bagged. Not a lot to see, and I missed spotting the remains of the wartime air crash. I did meet the first walkers of the day here. Back to the spring on Haycock where I had left my camping gear, had a brew and put my shorts on, sunshine had prevailed since leaving here an hour ago. 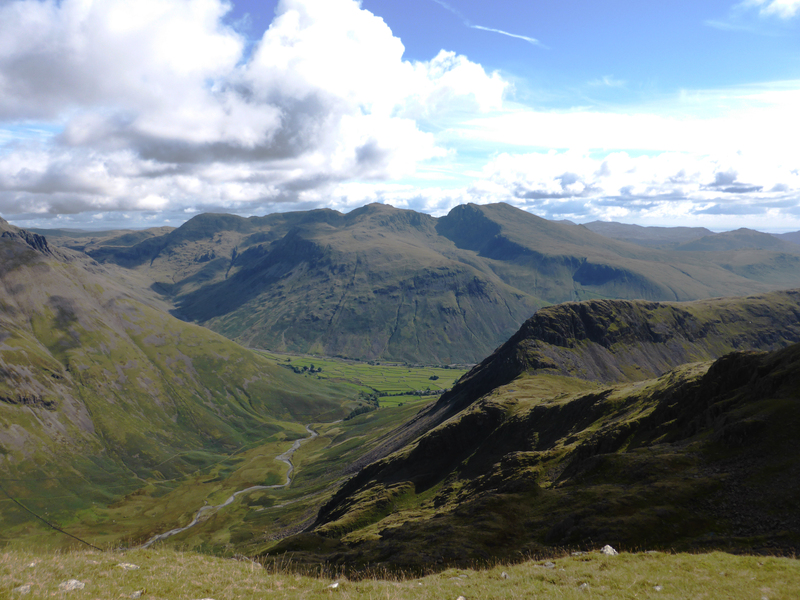 Now, it was a short traverse around to pick up the Red Pike path and along the edge of the Mosedale precipice, enjoying the extensive views down into the beck and across Wasdale to the coast. 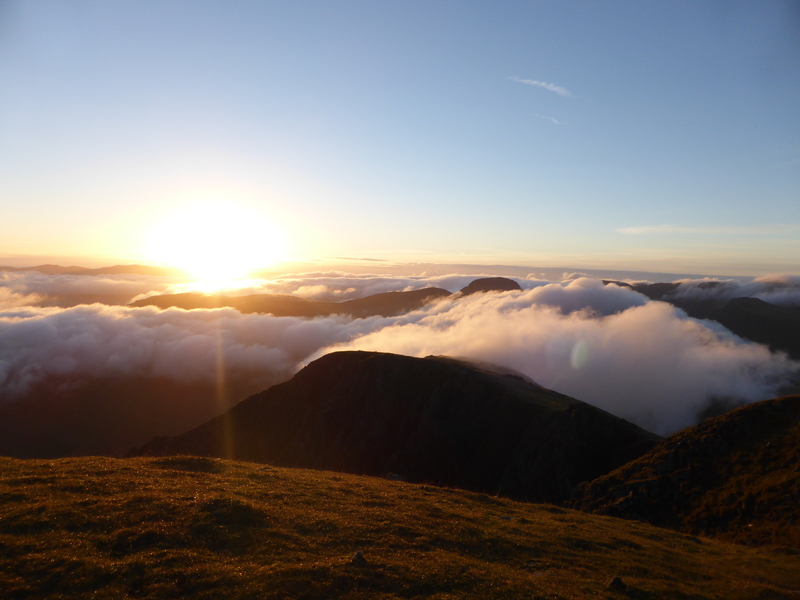 Red Pike is a good way to finish the round, so I felt, justifying missing out Yewbarrow. My energy levels were low and time was pressing so I wandered down Overbeck and back along the road to Wasdale Head. 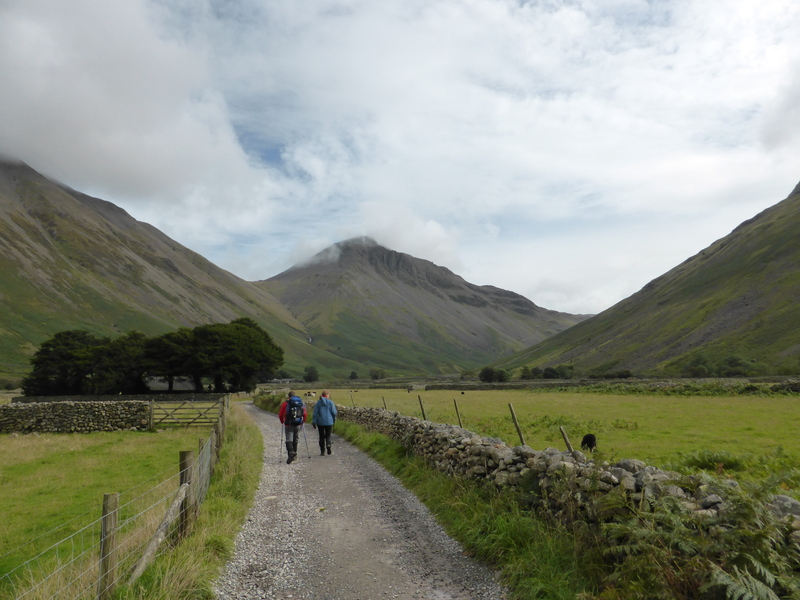 A lovely walk, great couple of days and Mosedale Horseshoe a fabulous route. This weekend also ticked off 8 more fell tops, taking me over the 50% level. My top down approach takes me down to top 8, with only Nethermost Pike left out of the top 16. I know its the same old view, but still the best in the country. You’ll have to start taking the loaves and fishes out onto the fells with you! 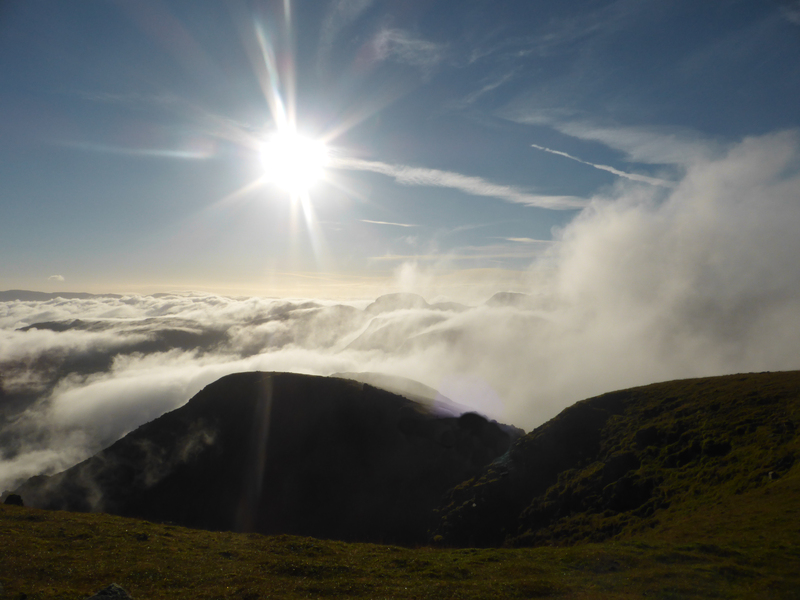 This entry was posted on September 16, 2013 by antondotreks in Blog, Expeditions, Lake District and tagged Brocken spectre, Glory, Lake District, Mosedale, Pillar, Wainwrights, Wasdale.